I've worked with Coca-Cola in a number of capacities over the years. From white-labelling the motion and development of the original iCoke website, through to becoming creative lead of the digital AOR, my experience in this iconic beverage is well documented. I've been very privileged to lead a number of incredible campaigns and truly talented teams to success. 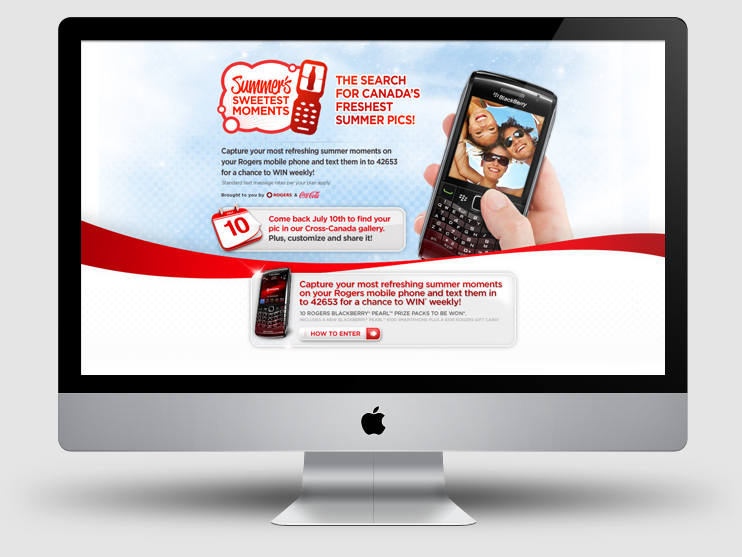 A summer contest that lived both within the mobile and computer environment. The premise was simple, snap a shot of your favourite summer moment and upload via your cellphone to iCoke to win. Mapped across Canada, we collectively gathered the tone of the nation, while extending reach and user interaction by allowing them to create customized elements of their photos for download. Going up against Gatorade, I placed the focus on the heart of the product. The competitor showcased professional athletes, aspirational people at the top of their game... However Powerade was one of a more personal and internal approach - this was about your game. The composition utilized a variety of sports related imagery cycling around the hero bottle, with emphasis that the product itself was the heart of sports. As part of the holiday-tie in program with Coca-Cola and WWF, we developed an awareness calculator that lived on the iCoke homepage. A simple quiz that calculated your "paw-print" (a play on the carbon footprint phrase), the answers you selected on the quiz adjusted in real-time to showcase the environmental impact our decisions have on the polar bears ice-flow. To support Peace One Day, an international day of peace, we derived a simple solution for donation. Any company could simply sign a cheque over - but instead we let the iCoke users make the monetary decision; donating their own iCoke points for peace. Creating further consumer engagement with pin entry on the iCoke site for Nestea meant capturing attention of the audience in a simplified contest. A random based entry allowed users to enter their information daily to win a prize. Emulating the destination aspect of the trip (in phase 2) and the consumption venue aspect of the product (in phase 1) served as the visual device that randomly displayed for pin entry. henderson bas revolutionized the redemption marketplace with the launch of iCoke, a portal for the tasty beverage that extended consumer engagement with the brand. Users could collect points and pin numbers and redeem for prizes, iTunes downloads, discounts as well as learn about upcoming events, contests and happenings with the brand.